Is PPC Advertising Right for You? Should You Outsource Your PPC Advertising? How Much Do You Love PPC? Pay-per-click (PPC) advertising (aka “search engine marketing” or SEM) continues to gain favor with online marketers across almost every industry, and from SMBs to enterprise organizations. Many small business owners start out with online marketing strategies that are generally considered “free,” like SEO and social media—although if you value your time you know that doing those well is not “free.” As business booms and companies grow, many business owners assume that paid online advertising options, like PPC, are the natural next steps. But PPC is much different from other online marketing options. Doing it well means first determining if it’s right for your business, and if now is the right time. If it is, it’s hard to know where to start, and mistakes are easy to make. Keep reading to determine if your business is ready for a PPC campaign, what you need to know to get started, and how to optimize your campaign for the best results. Is Pay-Per-Click Advertising Right for Your Small Business? As with most business decisions, marketing strategies seem to weigh heavier on small businesses. SMBs need all the exposure and promotion they can get, but have less to spend on it. That makes every win a huge success, but it also makes the risks scarier. What’s more, modern small businesses have more marketing outlets to choose from than ever before. Options are good, but it can also be hard to tell where to start, what will work best, and how much to invest in each one. PPC is one of several digital marketing strategies, but how do you know if it will return qualified leads and help close sales for your brand? A look at the pros and cons of PPC is a good place to start. Sometimes instant is bad (noodles and coffee come to mind), but sometimes instant is good. As soon as a PPC campaign is set up, your ads start to appear to a very targeted segment. Search engines have, essentially, built momentum for you to tap into at just the right moment. If you’ve ever been accused of being a control freak, PPC won’t judge you. Where social marketing relies heavily on the whims of your audience, and SEO relies on sometimes unclear search engine algorithms, PPC lets you fill in every field. Of course, user whim and search engine algorithms are still factors with PPC, but you can get your hands on more details with PPC. PPC can be quick, but it’s definitely not easy. Doing it right requires a good investment of time, and a sharp eye for data. PPC, like most marketing strategies, cannot be turned on and left alone. Doing it well requires monitoring and analyzing data, and adjusting for those insights. Metrics and analytics are only part of the intricacies of PPC. There are various ways to track metrics and all of them need to be set up and maintained properly. The technical details of a successful PPC campaign can pile up. Doing it well requires experience and an acute focus. Do you have a specific marketing campaign coming up, or a specific goal in mind for brand awareness? Is your website design complete? Do you have specific pages designed for conversion? Do you have a chunk of your marketing budget available that you are willing to invest in an ad campaign? Do you have the budget to hire a PPC agency? Do you or a trusted staff member have time to set up, monitor, adjust, and review the campaign; or to work with an agency who will do much of the work for you? If you answered, “No” to any of the above, you’re probably not ready for PPC just yet. Get those ducks in a row so you can launch an effective campaign in the future. Should you Outsource PPC or Keep it In-House? Small business owners and entrepreneurs are great at doing a variety of business tasks—from accounting to sales to marketing. Keeping things in-house is a great way to save much-needed funds, but outsourcing your weaknesses is a necessary skill for small business owners. 1. How Much Time Do I Have? PPC is not a plug-and-play strategy, and it’s not something you can do over lunch or with a few evening hours. Let’s be real: you’re a small business owner—time is not something you have a lot of. PPC these days is about more than choosing keywords and assigning dollar amounts. In addition to strategy, set-up, monitoring, and analyzing, a good PPC manager will spend time staying up-to-date on strategies and best practices. 2. How Much Do I Love PPC? If keyword data excites you, then you might be in a really good place to handle your own PPC advertising. If not, you might want to hand it off. In addition to the technical details of any PPC campaign, the nuances of PPC best-practices also require time and experience to master. Most entrepreneurs strike out on their own because they’re passionate about their work, their solutions, and/or their customers—not because they’re passionate about keywords and marketing metrics. If it’s time to add PPC to your marketing strategy, but you don’t have the time or the drive to own it, send it out to someone who does. When the time comes to add PPC to your marketing mix—whether you’re going DIY or outsourcing—there are two main considerations to go over before you, or your agency, starts bidding on keywords. The best PPC ad is only as good as the website or landing page it sends users to. Take care of any necessary touch-ups or updates on your website before launching a PPC campaign. It doesn’t need to look like a Fortune 500 company site, but make sure you’re competing in your local vertical. Then, take a second look at your site with the end of your PPC campaign in mind. Many times, especially for a PPC campaign, that means optimizing an existing page or—more likely—creating a new page specifically for that PPC ad. Home pages and landing pages have different goals, and a well-designed PPC ad that sends someone where he doesn’t expect to go is a wasted click. Make sure your website, in general, is aesthetic and user-friendly compared to your direct competitors, and then make sure you have a specific landing page designed for a specific goal that relates to your PPC campaign. Every business owner needs to decide what a lead is worth in order to set a strategic budget. How many qualified leads make it through your sales funnel, and how big is your profit margin? That can be a difficult number to determine, but it will give you an idea of what you should pay for a click. Then, consider your industry. Even if all other factors are the same, the value of a lead will vary by industry because of what your competition is willing to pay. Once you have a number on your PPC budget, the next decision is how to spend it. With a budget ready to go, go big. One of the great things about PPC is that you are effectively buying advertising spots and market data at the same time. Clicks and conversions are a bit of a gamble—especially at first as you learn to target your audience—but the data is guaranteed. Developing a PPC budget requires a little analysis of your sales model, which can be especially challenging for small businesses who haven’t testing their sales funnels much, but it’s the only way to really determine if your campaign is working for you. If you have to make some estimates, start there and adjust the budget as you gain experience. If you’ve already waded into PPC, you know there are a lot of variables to consider. Filling out the right fields to get a campaign off the ground is just the beginning. From ad copy to SEM trends, and from metrics to common mistakes, there is almost always more to know—and more to improve—about PPC. Copywriting is a celebrated profession because it can be very difficult. Communicating effectively in so few characters and so small a space takes practice, but a few pieces of good advice can get you off to a good start. Include a CTA. This can be as simple as starting with a verb. Don’t just tell the user what you have (“New widgets!”). Tell him what you want him to do (“Get your own new widget!”). Depending on the term you target, that’s what he wants to do also. Focus on your USP. Your brand’s unique selling proposition/point is what separates you from the competition. Are you the best? Fastest? Closest? Cheapest? Friendliest? Most experienced? Original? Use it in your ad and stand out on the search page. Use numbers, symbols, and punctuation well. Numbers and symbols break up text and make your ad more engaging. (Just don’t overdo it, and make your ad look like spam.) Proper punctuation helps the reader scan your copy, and a well-placed exclamation point can add a sense of urgency. Test some variables and check on results. Do your ads perform better if you include a specific price tag? Try casual language versus formal, and see which converts better. Any question you have about how to phrase something can be answered by testing variables. Search engine marketing is constantly evolving to keep up not only with search engine changes, but also with general digital marketing best-practices and user behavior. Creating a truly effective campaign often requires staying up with the trends. Three of the latest and most important are mobile, content marketing, and retargeting. Mobile media usage has long been the preference for consumers, and is only growing. 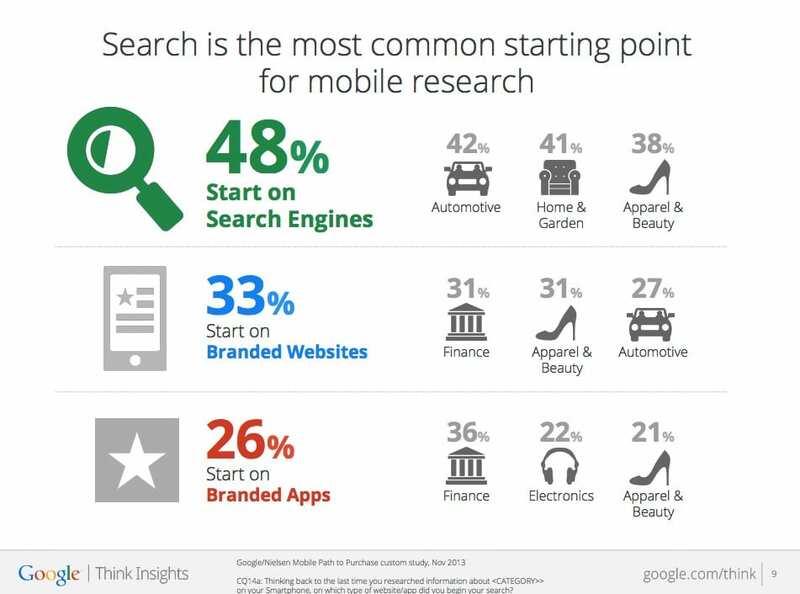 For almost two years search has been the most common place for consumers to start researching a purchase. Your ads need to be mobile-friendly. Content marketing is a well-established strategy in today’s digital marketplace. Brands from every industry, of every size, focused on every audience segment are discovering the necessity of serving modern audiences through high-quality content. As content marketing strategies increasingly grow to envelop every marketing channel, PPC ads are joining the party as well. Retargeting is itself evolving. There are several types of retargeting that marketers can take advantage of. The two most common retargeting strategies are search and site retargeting. One a user visits your brand’s site, site retargeting delivers your ad to that same user on other sites. Search retargeting—probably the fastest growing retargeting strategy—delivers your ad on other sites based on a user’s previous search activity. SEM/SEO retargeting is similar to site retargeting, but focuses specifically on the search terms used to arrive at your site in the first place. Contextual retargeting uses strategically placed retargeting pixels to target your ad to users who view complementary services on another site, or interact with your social media channels. Engagement retargeting delivers your ad to users based on how they engage with other content—like videos or gated content—on the brand site. Email retargeting monitors behaviors taken in regard to branded emails, and delivers appropriate ads to those users. Effective PPC means monitoring not only each individual campaign, but the entire industry in general. Trends and best practices evolve at the pace of the internet itself. Keeping up can be a full-time job. Search engines provide a lot of metrics and analytics data. Some of it is vital. Some of it is overwhelming. Knowing what the data should look like, where to focus, and what to check, and where to put your focus can make all the difference. Data changes, for example, should happen smoothly. Even your greatest, most creative campaign probably won’t inspire the kind of huge spikes that look good on fake line graphs. Each of the specific metrics has its own value, and will help focus, improve, and analyze each PPC campaign. Modified bounce rate is one of many metrics that can help improve and measure your campaigns. When it’s time to make big decisions about the future of your small business’ PPC strategy, though, focus on the bottom line. Conversion tracking can be easily turned on with Google and Bing, and will tell you how many of those impressions and clicks actually became leads. Google will also let you set up website call conversion monitoring to help you gather better insights. There are different strategies, formulas, and theories for measuring and calculating the ROI of your PPC campaign. Which one is best for your brand will depend on your specific situation. If PPC is new for you, rest assured that other marketers have already made some initial mistakes for you. Start a few steps ahead of the game by avoiding some common PPC errors. Ignoring negative keywords—Negative keywords will save almost any campaign a lot of wasted clicks, but too few marketers and small business owners take the time to enter them. At least take a few seconds to include “free” in your negative keywords list. Not searching pseudonyms—A lot of words and abbreviations have different meanings, especially online. “One such example,” explained Bob Bentz, ”is the term ‘mobile marketing.’ Mobile marketing means marketing to consumers’ mobile phones, but it also means those trucks that run up and down the Las Vegas Strip with advertisements on the side.” Conduct a depersonalized search for your top keywords and make sure you know what you’re targeting. You’ll make mistakes of your own, and you’ll learn valuable lessons from them, but save yourself some time (and money) by at least avoiding these. PPC is not a side-project. It can be enormously valuable for small businesses, but it can also be enormously draining. First, determine if it’s right for your brand and your product, and if it is—if now is the right time. How’s your marketing budget? How much time do you have? Who is going to run it? If you decide to jump in, remember to start with your budget and your website, not with the Google AdWords sign-up screen. PPC is a key strategy to many robust marketing campaigns, but—as with all things marketing—it’s fluid and ongoing. If you’re prepared to monitor, adjust, and stay up-to-date it will probably serve your brand very well. Matt is a Senior Account Manager in charge of Community at Hanapin Marketing. With eight years of PPC experience, Matt specializes in ecommerce PPC and client relations, while also overseeing content production for PPC Hero. Steve Hammer is President of the award winning digital marketing agency RankHammer, a digital marketing firm with a focus on measurable results. They perform search marketing with industrial grade quality. They have helped large clients with SEO, PPC, and analytics.